The Student First Programme and Contact Centre teams have worked closely this year as part of the continued enhancements to our myUC online enrolment system. The Contact Centre receives up to 6150 contacts per month by phone, email and web chat, rising to up to 15400 over the enrolment period from November to March. On average, questions about the enrolment process make up about 45% of queries. Since the Contact Centre is usually the first point for contact for prospective students wanting more information about enrolling or help with their application, it’s been vital to ensure the team has the latest information on hand for a positive customer experience. With the enhancements to myUC there are increased self-service options for students, and the application and enrolment process is much faster and more user-friendly. This has meant a significant decrease in calls to the Contact Centre asking for help with enrolment or problems with the system – calls about help with enrolment are down 20% compared to the same period last year, even though the total number of applications is higher. With less time taken up on basic queries or system issues, the Contact Centre team have more time to spend on high value tasks and assisting customers with more complex enquiries. Student First Programme team members have supported them with training and by sitting with the team to understand their needs. This means releases have gone smoothly and the team can focus on what they do best, providing excellent customer service. The latest exciting development is the ourUC staff portal, which allows UC staff to apply on behalf of a student and perform admin tasks in myUC. The Contact Centre were the first to get access to this new feature, which has made an enormous difference to their work and ability to efficiently help students. Their feedback will help inform future developments. If you’d like to know more, contact the Student First Programme anytime. We are always happy to provide demos or training for your team so we can help you get the maximum benefit from the new tools we’re developing. The final Student First Programme Release for 2018 took place on Tuesday 27 November. Below you’ll find a brief outline of what was included in the release. Course Selector for returning students: Returning students now have access to the new Course Selector, and can complete their enrolment in myUC, rather than the UC Student Web. Their enrolment process is now run entirely in the new system, contributing to a smoother and faster experience. Click here to see student feedback on the new enrolment process. Manage My Study: Gives students an overview of their current enrolment and future year applications, including qualification, subjects and courses. Students can also see their qualifications for historic years and manage each application individually, e.g. accepting an offer for one year and withdrawing their enrolment for another. Withdraw Application: Allows an applicant to withdraw their enrolment/ATE in myUC before their Offer of Place/Enrolment Offer is available. ourUC (Staff Portal): Contact Centre staff can use the enrolment portal to support students with their UC application, helping them to progress smoothly through the process. connectUC (Agent Portal): Agents can easily create and submit applications to UC on behalf of international students, so they have the best possible chance of getting an Offer of Place for their international applicants. Agent to Student Handover: International applicants who have applied through an agent can take over their application process quickly and easily, so that they can accept their Offer of Place and get ready to arrive at UC. International Offer of Place Proforma Invoice Enhancements: Clearer and simplified content on costs, which are itemised and totalled, contributing to a better International enrolment experience as students will be aware of what payment is required. In 2018 one of our key focus areas has been improving the online enrolment process so that it’s faster, simpler and more certain. Recently we released a new Course Selector tool to help do just that. We asked some students what they thought of it, and you can see their reactions in this video with a comparison to the old UC Student Web experience. The new Course Selector in myUC will be available for returning students from 27 November 2018, in time for the release of exam results. This means that all students can now complete their enrolment using the new system. We’re actively seeking more student feedback on the new enrolment experience from students, and we encourage you to pass on any feedback to us at studentfirstfeedback@canterbury.ac.nz. 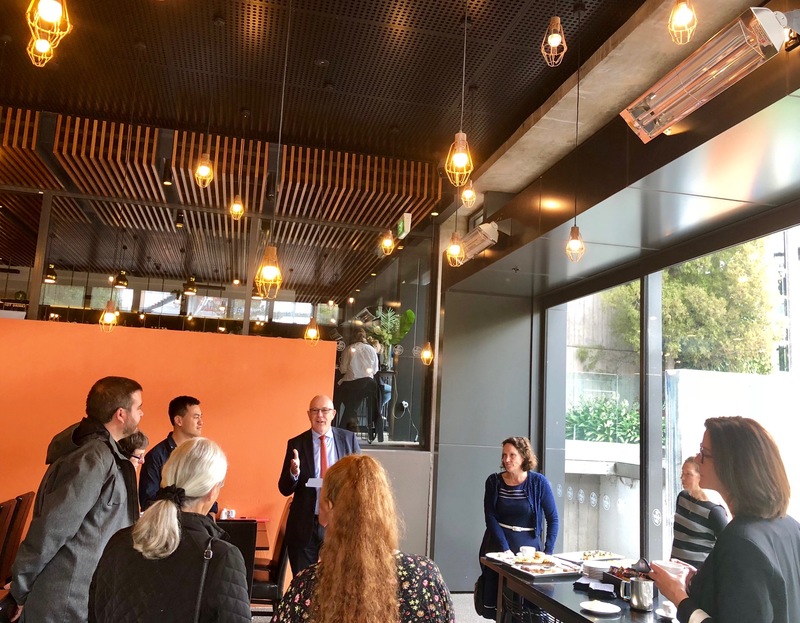 Recently the Student First Programme team held a morning tea to celebrate the successful launch of the Course Selector and acknowledge the input of the staff who have made it possible. This has included extensive work on the Academic Regulations and input from subject matter experts across the University. Deputy Vice-Chancellor | Tumu Tuarua, Professor Ian Wright and Assistant Vice-Chancellor | Amokapua Akoranga, Professor Catherine Moran both spoke how the new enrolment experience has benefited UC students and staff, and acknowledged the hard work that UC staff and the Student First Programme team have put in to make this possible. The improved enrolment experience is reflected in the positive trends and year-on-year growth in Applications to Enrol so far for 2019 enrolment. Students are moving through the process quickly and smoothly, with minimal issues. We’re looking forward to seeing this continue over the next few weeks as we progress through the enrolment period. The Student First Programme is helping prepare UC for the future, and putting students at the heart of our business. It’s focused on improving the student administration experience so that UC can continue to deliver world-class education. In 2018 our focus has been on improving systems and processes to support conversion and retention of students, delivering 8 projects across the year. We host monthly User Community Updates where our team shares updates on all these projects. 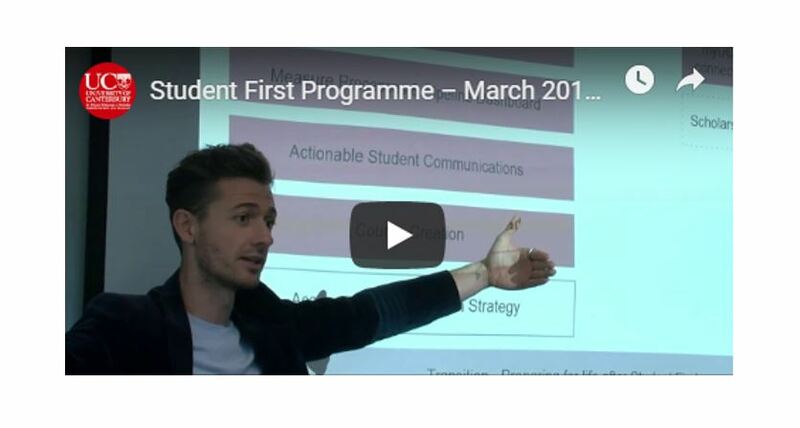 You can also view all our videos from these sessions on the Student First Programme Intranet page.